For kids who love stories and anyone who loves stories for kids! 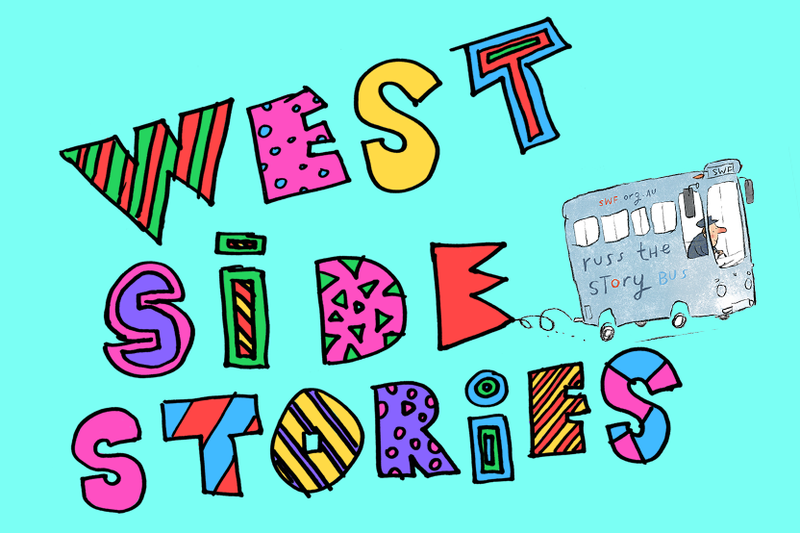 WestWords’ West Side Stories was a special series of author events for children and young people across all ages. In two separate events, over two days West Side Stories included over 15 different writers, ranging from children’s picture book authors and YA novelists to poets and playwrights. SWF’s Russ the Story Bus – the Sydney Writer’s Festival’s mobile library and book exchange – was also on hand for kids to browse through, and swap a pre-loved book for a brand new favourite. Some of the best Australian storytellers presented, such as the much loved, multi-award-winning children’s author Libby Gleeson, this year’s CBCA winner of both Best Young Reader and Best Picture Book. Author, illustrator and poet, Elizabeth Honey, (Hop Up, Wriggle Over, That is Not a Daffodil, Ten Blue Wrens, The Moon in the Man) and perennial favourite Duncan Ball with Selby and Emily Eyefinger were also in attendance. Exciting new talent Wai Chim with her humorous Chook Chook series set in rural China was another who presented. West Side Stories also saw an exciting new poetry performance from The Red Room Company’s The Disappearing 2.0 winners, including 2015 CAL WestWords Fellow Maryam Azam, Rico Craig and Miro Bilbrough. Guitar-carrying author Richard Harland spoke about the exciting world of steampunk, while Sydney Opera House playwright Maryam Master spoke about adapting best-selling author David Walliams’ novel, Mr Stink , from the page to the stage for its 2016 Opera House run. Monsters, mysteries and mayhem were abound when Blue Mountains local Catherine Jinks explored the dark side of storytelling, whilst this year’s CBCA winner for Older Readers, Claire Zorn discussed where her ideas come from. West Side Stories invited kids to get interactive and help solve missions, battle sea monsters and find the secret to writing their own exciting stories with Deborah Abela while YA novelist and children’s author, Kylie Fornasier (Masquerade, The Ugg Boot War, The Prince Who Shrank) spoke with award-winning author, Felicity Castagna, (The Incredible Here and Now) – both from Western Sydney, about the importance of place, real and imagined, in helping us understand who we really are. WestWords’ West Side Stories along with Sydney Writers’ Festival 2015 Children’s Festival of Moving Stories was a FREE program for children, young adults and their families to explore ideas, discover new worlds, and share in the magic of storytelling.